Deirdre is alone in a crumbling block of flats after her grandmother dies. While looking out the window one day, she sees a boy who is familiar. She hasn’t seen him in years but Deirdre and Gal share a secret. Together, he and Deirdre must discover the secret of the old building, before it collapses and the secret is lost forever. 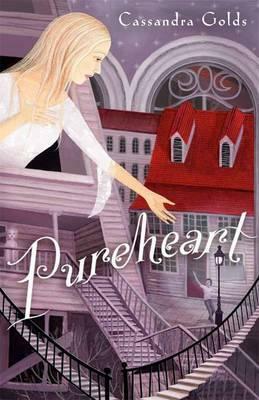 Award-winning author Cassandra Golds’ new novel, Pureheart, is a beautiful and multilayered book that had me contemplating its meaning long after I finished reading. Deirdre and Galahad first meet when they are five years old, when Gal comes to live with Deirdre and her grandmother at Corbenic, a block of flats owned by Deirdre’s grandmother. Over the few short months that Gal is there, an undeniable love forms between the two young souls. Deirdre’s grandmother is disgusted, banishing Gal and forbidding the two from ever seeing each other again. It’s not until the night that Deirdre returns from her grandmother’s funeral that Galahad dares to come back. But instead of leaving with Deirdre like Gal had planned, the pair must search the decaying labyrinth of Corbenic to find a secret the building has been hiding from them since their first encounter. Golds’ ability to turn a crumbling old building into a captivating main character is astounding, leaving me to ponder the meanings and secrets our own homes may hold.